This publication contains detailed information about ENWRA's projects and goals, as well as a general overview of groundwater in Nebraska. 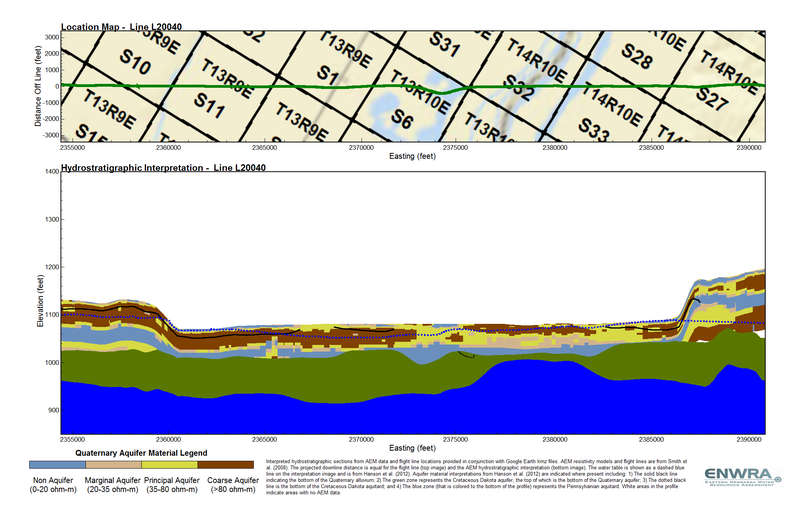 This report contains maps and discussion of the hydrogeology in the Swedeburg, Nebraska area based on interpretation of HEM data collected in 2009. 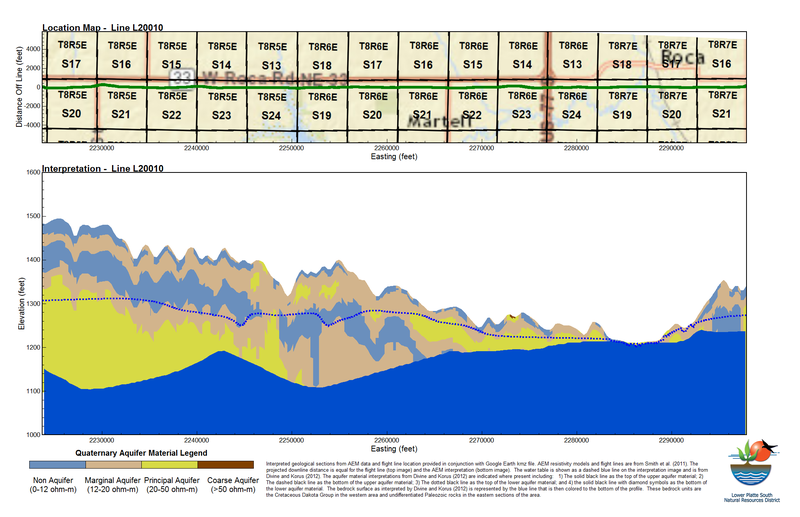 This report contains maps and discussion of the hydrogeology in the Sprague, Nebraska area based on interpretation of HEM data collected in 2009. 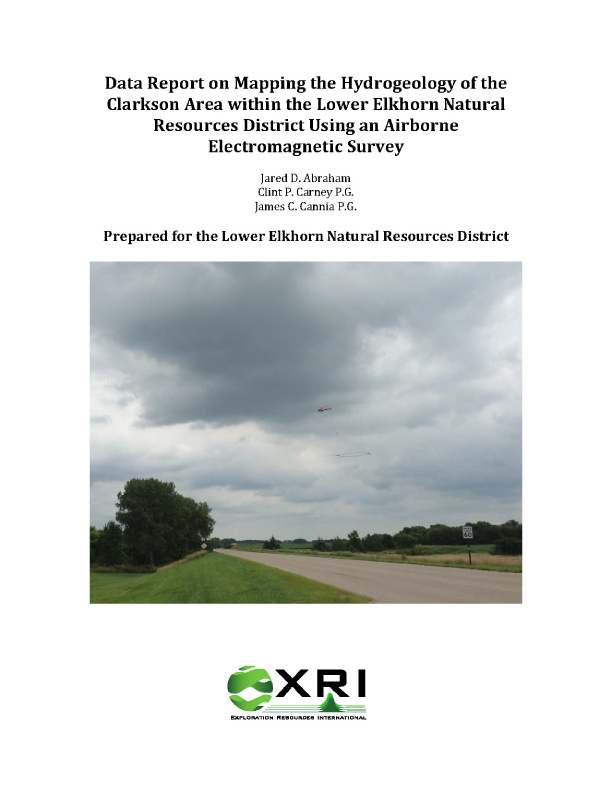 This report assesses multiple geophysical techniques that were applied near Oakland, Nebraska. This report contains maps and discussion of the hydrogeology in the Ashland, Nebraska area based on interpretation of HEM data collected in 2006. 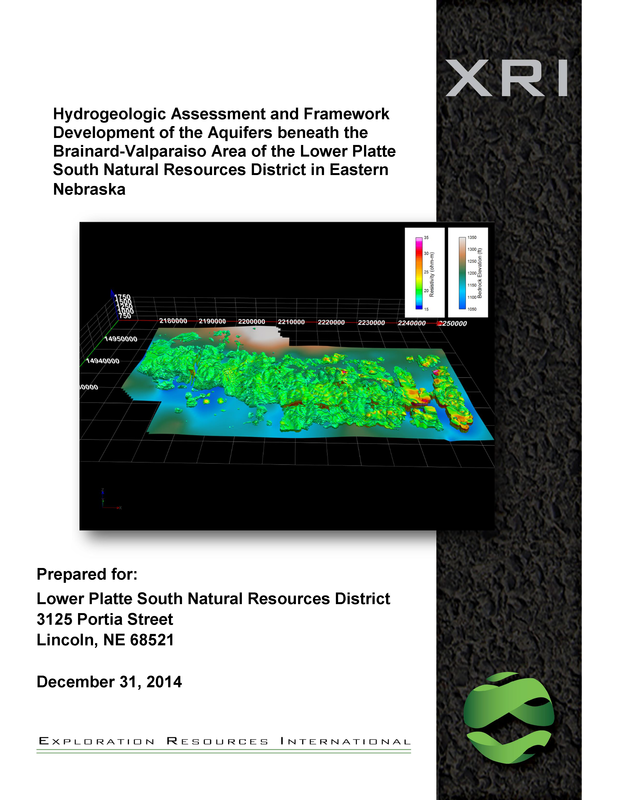 This report contains maps and discussion of the hydrogeology in the Firth, Nebraska area based on interpretation of HEM data collected in 2007. This document presents three regional geologic cross sections and accompanying text describing the methodology used to draw the cross sections. This report assesses multiple geophysical techniques that were applied near Oakland, Ashland and Firth, Nebraska. This poster summarizes some of the HEM data collected in 2009. 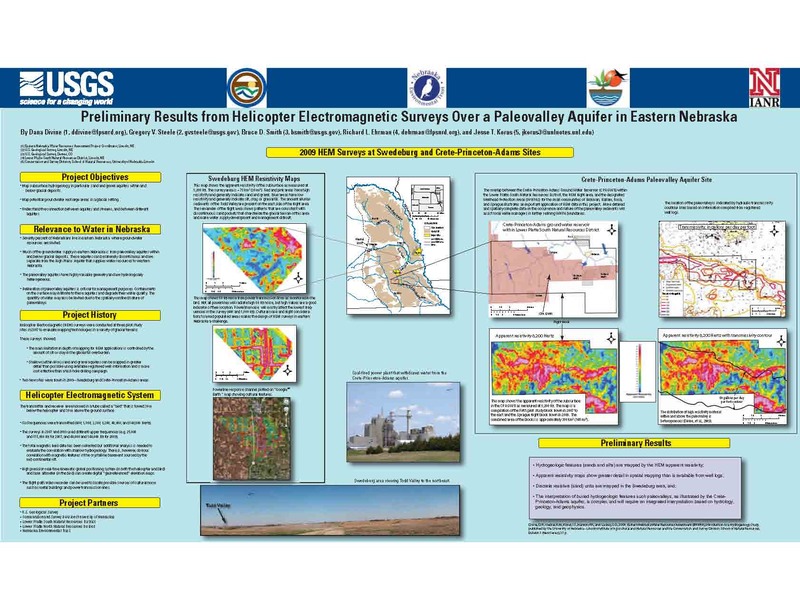 The poster was presented at the 2009 Geological Society of America Annual Meeting in Portland, OR. 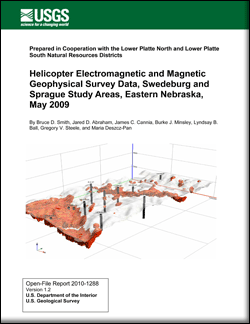 This report contains data gathered from HEM surveys flown in the Sprague and Swedeburg areas in the spring of 2009. This model assesses the effects of changes in on-farm irrigation efficiency, land use, and irrigated acres on groundwater levels and streamflow for improved water management. 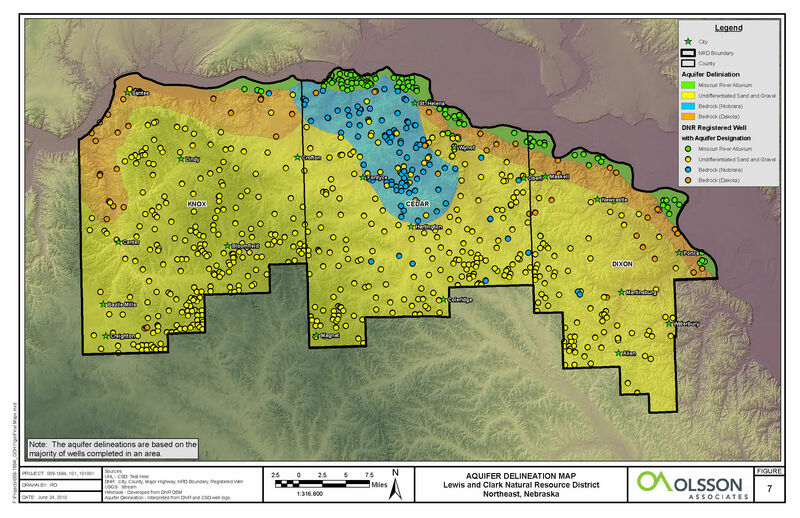 These maps show the distribution of unconsolidated sand and gravel units serving as localized aquifers at the NRD scale. Report on AEM flights conducted for the area between the towns of Clarkson and Howells that experienced record groundwater declines during 2012. Exploration Resources International (XRI) entered into an agreement with Lower Elkhorn to undertake the hydrogeologic study in 2013. The results presented in the Clarkson-Howells Report have been provided in Google Earth format. You can download the free version of Google Earth Pro by clicking here. Once you have Google Earth installed on your computer you can download the .kmz file (656 KB) from the ENWRA Dropbox here. Dropbox is free for users (you can select "no thanks" to the sign-up for a Dropbox account and still download the files). If you already have a Dropbox account, please save to your computer hard drive (choose direct download) so as to not fill up space on your personal Dropbox account. Report on AEM flights conducted for the DVB area that experienced groundwater declines during 2012. 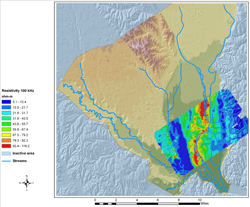 XRI conducted the hydrogeologic study in August 2013. The airborne survey results from ENWRA's 2007 Oakland, Ashland and Firth Pilot Study Sites (multiple reports listed above) have been converted into Google Earth format based on interpretation of HEM data collected in 2007. Click here for a link to download the data (you can select "no thanks" to the pop-up and still download the files). This shows inverted HEM data from the Ashland pilot study site. The white areas are where data has been removed to provide a cross-sectional view. The starting viewpoint is to the north. The Todd Valley is represented by red in the upper left hand corner and the glacial till uplands near Gretna by blue in the upper right hand corner. This is the Firth voxel model generated from inverted HEM data. Red zones are areas having resistivity values greater than or equal to 80 ohm-meters. The semi-transparent layer represents ground surface, and the black columns represent test holes. The starting viewpoint is to the northwest. The two red areas likely correspond to the edges of a paleovalley aquifer. This is the Oakland voxel model generated from inverted HEM data. Red zones are areas having resistivity values greater than or equal to 80 ohm-meters. The semi-transparent layer represents ground surface, and the black columns represent test holes. The starting viewpoint is to the north. The red swath coincides with sand and gravels associated with Logan Creek.